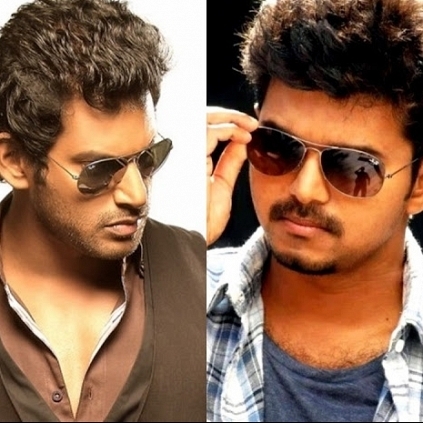 VIJAY AND VISHAL OPT FOR THE SAME DATE? Vishal starrer Paayum Puli as reported earlier is progressing at a lightning speed. The shooting for the film will be wrapped up tonight (July 3) with the usual 'Pusanikkai' ritual. From sources close to the project, we hear that the single track of the film will be released on July 15th and the music composed by D Imman will release on August 2nd. Interestingly, audio of Vijay's Puli is also expected to be released on the same date. With Paayum Puli's post production work happening in full swing for the first half of the film, the movie is said to hit the screen on September 4th. The Vishal starrer features Kajal Aggarwal as the lady lead with Soori and RK in important roles. Puli off to a spectacular feat! Samantha at an unreachable height! Almost 2000 between Vijay and Ajith! How has Superstar Rajinikanth influenced Maari? Kaan is going faster than expected! Vishal Starrer Paayum Puli Directed By Suseenthiran On The Verge Of Completing Its Shooting. Will Vishal Recreate His Madurai Magic With Paayum Puli? Vishal, Suseenthiran And Team Paayum Puli To Camp At Madurai For 35 Days. Catherine Tresa To Pair Up With Vishal In The Upcoming Pandiraj Film. Arya And Vishal Rave About GV Prakash Kumar's Trisha Illana Nayanthara Songs. ''Uttama Villains May Come And Go, It Is All Part Of The Game'' - Lingusamy! People looking for online information on D Imman, Kajal Aggarwal, Paayum Puli, Soori, Vishal will find this news story useful.